The servers are fine, the lag is gone, and the levelling is good. 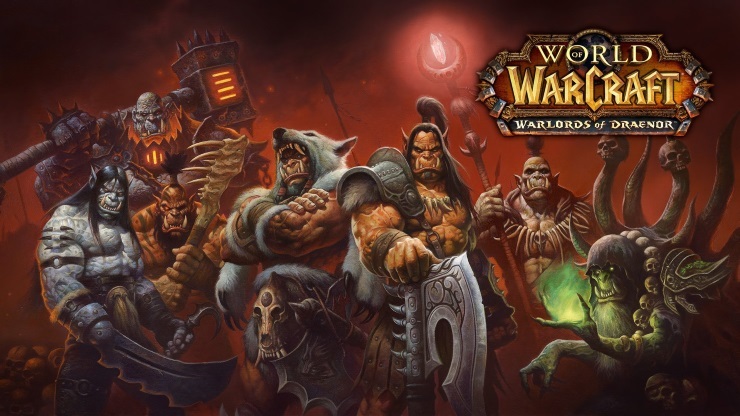 It wasn’t good for a while there, with the first few days of World of Warcraft: Warlords of Draenor ruined for many due to excruciating queues and broken features, but adventuring in the unbroken home of the Orcs and Draenei has smoothed out now for the most part. This makes me happy. Given the fun I’ve had levelling from 90 to 100 in Warlords of Draenor I didn’t want to talk about five hour server queues and lag so thick you moved slower than a snail in tar. Technical issues are annoying, undoubtedly, and they’re even more irksome when they lock you out of enjoying content this solid, but to sit and complain about them given Blizzard’s commitment to fix them (and given that my game has been largely fine since Saturday 15th November, excusing a long server queue in the evening) would be a prime case of damning with feint praise. 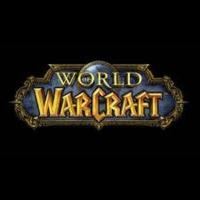 So what is it that makes questing in World of Warcraft: Warlords of Draenor quite so fun? 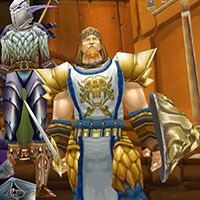 Well, it’s still an MMO, so this is still a game filled to the brim with plenty of busybody kill and collect quests and hotbar focused combat, but Warlords really shows how Blizzard have honed their sense of drama, escalation and conclusion in area and world design, and this is what gives Warlords of Draenor an incomparably satisfying levelling experience. Blizzard have been working on the pace and flow of levelling seriously since Wrath of the Lich King, and here it’s near perfect. Every zone begins with you establishing a foothold, creating a building, and being given an area specific perk, which includes air strikes and a personal tank – and by that I mean a literal turret and explosions sort of tank, rather than the usual MMO moniker. Quests throughout the areas establish lore, and the final objectives always involve a great instanced element (such as the impressive and powerful Battle for Shattrath) that helps establish major characters and even utilises Warcraft’s stylised visuals in some very nice cut-scenes. It would be hard for anyone to hit level 100 without bearing some degree of contempt for the Iron Horde and their sort, which is an important factor as it gives your continued investment in Draenor more purpose than simple loot greed. The quest trail through Draenor is littered with gorgeous environments, hidden rare enemies, secrets, and the expected cavalcade of references and classic characters going right back to vanilla World of Warcraft and earlier. Given that this is an anniversary year and we’re visiting an alternate timeline set 35 years in Draenor’s past this is unsurprising, but a quest to locate Mankirk’s girlfriend will inevitable raise a few cheeky smiles amongst older Warcraft players, while the potential opportunity to encounter and confront Ner’zhul (knowing about his future role in the creation of The Lich King) is sure to send shivers down the spine of any Warcraft lore fiend. The environments are the stars of the show. The Draenor presented here is a thing of beauty compared to the hellish vision seen in Burning Crusade. Shadowmoon’s plains and forests hide gorgeous Aztec inspired temples. Nagrand combines open plains with massive rock arches, littering its greenery with all manner of outlandish grazing beasts. Spires of Arak wins best entrance, mind, having you peek down on a dense forest from a mountain path, rubbing shoulders with fleeing avian-like outcasts as you see a super weapon torch a village below to the refugee’s dismay. It’s as affecting an introduction to an area as you’d expect in any RPG and is enough to have you pelt down the mountain at breakneck speed, ready to administer random justice upon the first thing silly enough to look at you sideways. 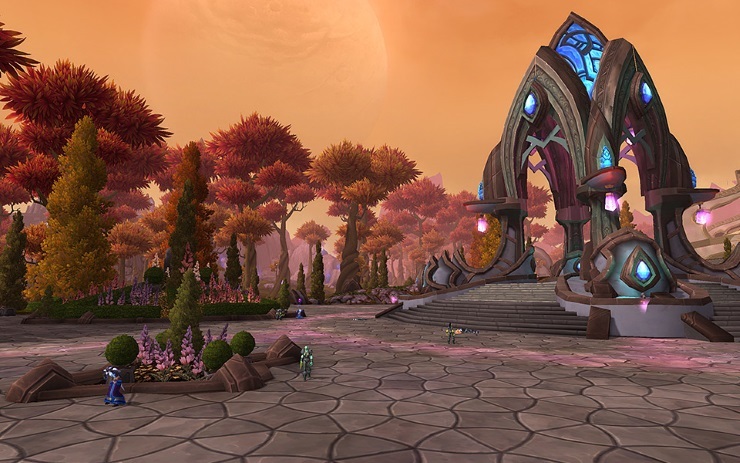 Blizzard’s ability to create a sense of place is well documented, and it’s as strong as ever in Warlords of Draenor. There are some moments of monotony, which is unfortunate. 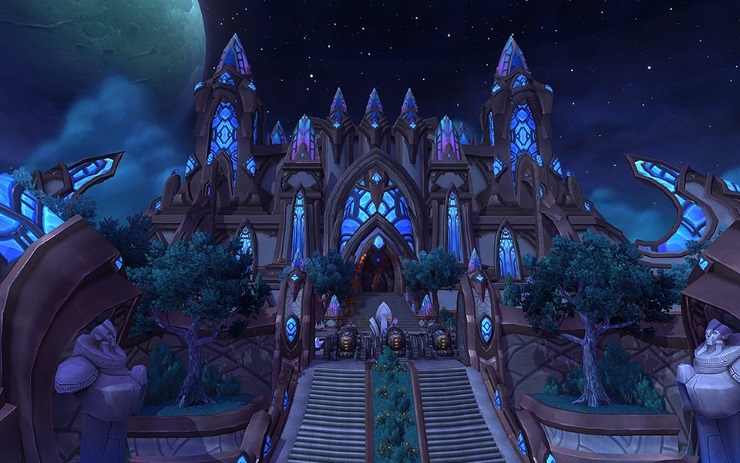 Spires isn’t a varied enough region given the glut of missions it holds, and party focused dungeons are largely restricted until after you reach level 100, meaning that you’re at the mercy of constant kill quests. 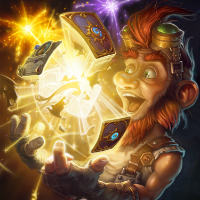 That said; early dungeon-play points towards a difficulty that’s more in line with older World of Warcraft expansions, with a focus on spell interruption and careful enemy pulls. On more than one occasion I’ve heard other players comment on the difficulty in a good way. My personal favourite was “yeah, you actually seem to need a brain to play Warlords of Draenor”. But this sort of response isn’t unexpected given the near universal ire for Mists of Pandaria’s toned down challenge. 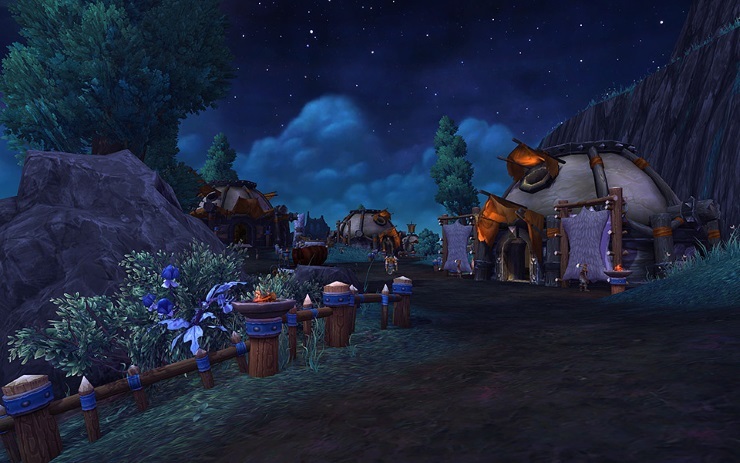 So far World of Warcraft: Warlords of Draenor isn’t a revolution, but it is refinement. Improvements to character models are nice, continued adjustments to abilities promotes a focus on how to use them instead of over worrying about minor percentages (even if everyone’s likely lost a favourite power in the process, taking a small bit of fun from the sandbox), and the whole thing feels significantly more slick in how it all pushes you along. The game is still built on many of the same foundations it was ten years ago, but the whole machine runs considerably smoother now. People remember WoW as this slow trudge of an experience, like the gaming equivalent of peddling up a beautiful hill, but Warlords of Draenor is like hopping in a raft and blasting down a powerful river at breakneck speed. Pretty and fun. After two expansions that felt a tad ambling, Warlords is an expansion with real teeth, purpose, grit and intrigue. 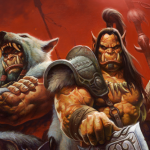 The world feels like classic Warcraft, grunts and all. After hitting level 100, there’s a lot to do. I’ve a Garrison to build, minions to nurture, and a long list of challenges, arenas, dungeons and heroic dungeons to tackle. Perhaps I shouldn’t be surprised that there’s a facebook-like game in World of Warcraft now, though. World of Warcraft has been pure compulsion driven loot craving for years, and this was the digital crack of gaming long before we started farming villes and crushing candies. I should be more surprised that it’s taken Blizzard this long to integrate a more social media-type gaming experience into World of Warcraft. I’m referring, of course, to the new Garrisons. Upon arriving in Warlords of Draenor’s alternate timeline Outland you’ll make a Garrison – your own personal base within the world that you customise and build up over time. You can even have friends over to enjoy your own pocket within Warcraft, and select fancy statues if you’re the sort of player to hunt out the rarest achievements. It’s not quite as empowering as genuine player housing (you certainly won’t be painting the carpet a funky shade of magnolia), but it’s a fun personal project all the same. The relation to social games comes in what the Garrison offers in terms of gameplay, and how it all works. One area of the Garrison allows you to send followers on missions (you recruit followers by completing quests around the world). Success rates of these missions depend on a follower’s abilities and level, and failure is brushed off with no consequence. The rub is that these missions take real time to complete: from thirty minutes to ten hours. That’s thirty actual minutes, to ten real-world hours. After the time is up you see how they did and reel in the rewards before shipping them off on another excursion, assuming you have the resources to do so. Alongside this, your Garrison can be used to create things, but these tasks are also achieved in real time. You can head to your blacksmith, for instance, and queue up a bunch of jobs to keep them busy for a few days. Real, actual days. The compulsion to hop on and ensure your Garrison is always buzzing and beavering away is absolutely real. I’m very aware of the simplicity of it all but there’s an unquestionable satisfaction in slowly but surely improving your garrison while guaranteeing that you’re sustaining the steady stream of rewards it offers. Someone got what is essentially a Facebook game in my Warcraft and, well, I don’t mind. The Garrison concept is basic, yes, but I find that it works as a wonderful palette cleanser next to the spread of energetic and feverish end-game content that Warlords of Draenor already offers. I suppose it also helps that there aren’t any micro transactions involved. Talking end game, Warlords of Draenor’s instanced dungeons are fun, fierce and varied, particularly after the more timid Mists of Pandaria. Warlords of Draenor is quick to punish bad enemy engagement or sloppy group tactics, with many bosses encouraging smart play to beat. From Ranjit’s huge wind vortex’s to Ner’zhul’s terrifying death walls and focus on organised target selection, Warlords of Draenor rarely pulls its punches, making for an experience that focuses entirely on party synergy, something more in line with older MMOs and something that only gets more demanding when you ramp things up to Heroic difficulty. When not punishing you with fiendish bosses, the dungeons find time to dabble in the sort of gameplay variety and spectacle that’s mistakenly unexpected of MMOs. Grimrail Depot stands as the prime example of this, asking you and your party to account for constant gale force winds as you fight relentless orcs on a claustrophobic moving train. 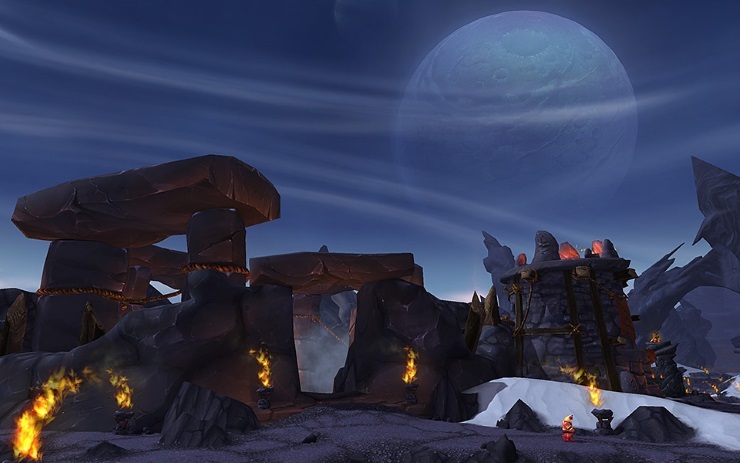 Warlords of Draenor’s dungeons are as surprising as they are tough. Player versus player is less remarkable, unfortunately. The PvP zone offers up the expected mess of particle effects and grunts that you’d expect from Warcraft by now. The focus was to have an area where players would do things and meet rival players as they did their daily quests off the beaten path, but my experience with the area has been one big, violent vortex in one spot that makes it impossible to leave the main thoroughfare. It’s hardly refined, but it makes for an amusing melee. The same can be said for the new PvP Battleground (Tarren Mill versus Southshore) that focuses purely on killcounts. Next to this maelstrom of hectic combat and taxing encounters, the slow burn of the Garrison is a calm retreat, and that is its ultimate success. The same could be said for levelling professions, and that’s still here, but the way a Garrison grows over time gives the whole thing a sense of purpose, and it’s endearing to have these timed elements slowly cooking while you slay big beasties, bestowing rewards upon your return. Warlords of Draenor is a game that understands the expectations of MMO players, and that is its biggest strength. The varied and engrossing levelling experience is one thing, but the mix of calming social game alongside tough end-game content reveals an understanding of player expectations that far exceeds recent genre competition. 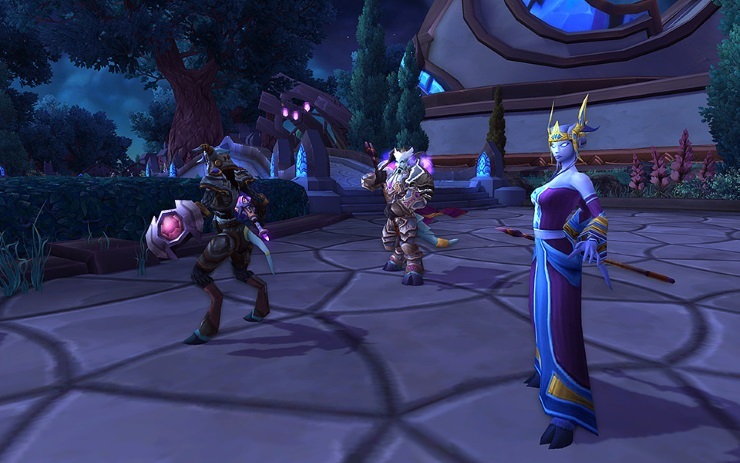 This is still World of Warcraft, and in that respect its action bar combat won’t be for everyone. 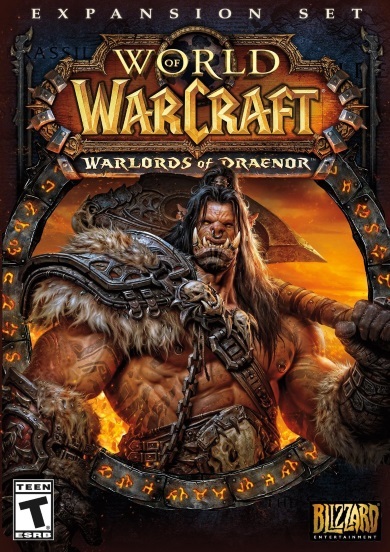 But for those that do enjoy a sojourn to Azeroth every now and then, Warlords of Draenor is everything anyone’s ever loved about World of Warcraft and then some. Engrossing quests and world design. Social Game elements work well. Some elements are still ten years old.